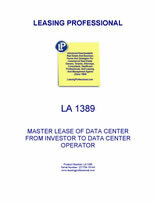 THIS MASTER LEASE is made as of ________________, by and between COMMERCIAL PROPERTY OWNER, LLC, a ___________ limited liability company (“Landlord”), with an address at _____________________, and DATA CENTER OPERATOR., INC. , a ______________ corporation (“Tenant”), with an address at _____________________________________. 1. Demise of Premises. Landlord hereby demises and lets to Tenant, and Tenant hereby takes and leases from Landlord, for the term and upon the provisions hereinafter specified, the following described property (hereinafter collectively referred to as the “ Leased Premises ”): (i) the premises described in Exhibit “A” hereto, together with the Appurtenances (collectively, the “Land”); (ii) the buildings, structures and other improvements now or hereafter located on the Land, including, without limitation, the roof of the buildings located on the Land (collectively, the “ Improvements ”); and (iii) the fixtures, machinery, equipment and other property described in Exhibit “B” hereto (collectively, the “Equipment”). “Additional Rent” shall mean Additional Rent as defined in Section 7(a). “Adjustment Date” shall mean the Adjustment Date as defined in Schedule 1. “Affiliated Party” shall mean Affiliated Party as defined in Section 19(a). “Alterations” shall mean all changes, additions, improvements or repairs to, all alterations, reconstructions, renewals, replacements or removals of and all substitutions or replacements for any of the Improvements or Equipment, both interior and exterior, structural and non-structural, and ordinary and extraordinary. Notwithstanding the foregoing, Alterations shall not include the addition, reconfiguration or removal of internal cabling, server cages or other equipment installed in the Premises primarily for the service of Tenant’s Customers. “Appurtenances” shall mean all tenements, hereditaments, easements, rights-of-way, rights, privileges in and to the Land, including (a) easements over other lands granted by any Easement Agreement and (b) any streets, ways, alleys, vaults, gores or strips of land adjoining the Land. “Basic Rent” shall mean Basic Rent as defined in Section 6. “Basic Rent Payment Date” shall mean the Basic Rent Payment Dates as defined in Section 6. “Casualty” shall mean any injury to or death of any person or any loss of or damage to any property (including the Leased Premises) included within or related to the Leased Premises resulting from a fire or other casualty affecting the Leased Premises. “Code” shall mean Code as defined in Section 30. “Commencement Date” shall mean Commencement Date as defined in Section 5(a). “Condemnation” shall mean a Taking. “Condemnation Notice” shall mean notice of the institution of any proceeding for Condemnation. “Costs” of a Person or associated with a specified transaction shall mean all reasonable costs and expenses incurred by such Person or associated with such transaction, including, without limitation, attorneys’ fees and expenses, court costs, brokerage fees, escrow fees, title insurance premiums, recording fees and transfer taxes, as the circumstances require, subject to any limitations hereinafter set forth. “Customer” shall mean a Person that has entered into an agreement with Tenant, or an affiliate of Tenant, to receive telecommunication, collocation or any similar or successor services from the Leased Premises. “Customer Agreement” shall mean Customer Agreement as defined in Section 19(d). “Debt Service” shall mean with respect to any particular period, the scheduled principal and interest payments due on account of any promissory note secured by the Mortgage. “Default Rate” shall mean the Default Rate as defined in Section 6(c). “Easement Agreement” shall mean any conditions, covenants, restrictions, easements, declarations, licenses and other agreements listed as Permitted Encumbrances or as may hereafter affect the Leased Premises. “Environmental Law” shall mean (i) whenever enacted or promulgated, any applicable federal, state and local law, statute, ordinance, rule, regulation, license, permit, authorization, approval, consent, court order, judgment, decree, injunction, code, requirement or agreement with any governmental entity, (x) relating to pollution (or the cleanup thereof), or the protection of air, water vapor, surface water, groundwater, drinking water supply, land (including land surface or subsurface), plant, aquatic and animal life from injury caused by a Hazardous Substance or (y) concerning exposure to, or the use, containment, storage, recycling, reclamation, reuse, treatment, generation, discharge, transportation, processing, handling, labeling, production, disposal or remediation of any Hazardous Substance, and (ii) any common law or equitable doctrine (including, without limitation, injunctive relief and tort doctrines such as negligence, nuisance, trespass and strict liability) that may impose liability or obligations or injuries or damages due to or threatened as a result of the presence of, exposure to, or ingestion of, any Hazardous Substance. The term Environmental Law includes, without limitation, the federal Comprehensive Environmental Response Compensation and Liability Act of 1980, the Superfund Amendments and Reauthorization Act, the federal Water Pollution Control Act, the federal Clean Air Act, the federal Clean Water Act, the federal Resources Conservation and Recovery Act of 1976 (including the Hazardous and Solid Waste Amendments to RCRA), the federal Solid Waste Disposal Act, the federal Toxic Substance Control Act, the federal Occupational Safety and Health Act of 1970, the federal National Environmental Policy Act and the federal Hazardous Materials Transportation Act, each as amended and as now or hereafter in effect and any similar state or local Law. “Environmental Violation” shall mean any violation of any Environmental Law. “Equipment” shall mean the Equipment as defined in Section 1. “Event of Default” shall mean an Event of Default as defined in Section 20(a). “Expenses” shall mean the Expenses as defined in Section 7(a). “Expiration Date” shall mean the Expiration Date as defined in Section 5(a). “Federal Funds” shall mean federal or other immediately available funds which at the time of payment are legal tender for the payment of public and private debts in the United States of America. “Financial Strength Criteria” as applied to any Person as of any date of determination means that such Person (a) has a net worth and financial strength on such date of determination equal to or greater than the lower of (1) the net worth and financial strength of Tenant as of the date of this Lease and (2) the net worth and financial strength of Guarantor (as such term is used in the Loan Agreement) on such date of determination, provided that in either case, the net worth of such Person is not less than $_______________, and (b) is experienced in, or, has a management team with experience in the management and operation of first-class data centers comparable to data centers operated by ______________, and which, clause (a) and (b) are demonstrated to the reasonable satisfaction of Landlord and Lender and approved in writing by Lender, which approval shall not be unreasonably withheld, delayed or conditioned. “GAAP” shall mean GAAP as defined in Section 26(a). “Guarantor” shall mean __________________, or a successor to Guarantor by acquisition or merger, or by a consolidation or reorganization pursuant to which Guarantor ceases to exist as a legal entity. “Guaranty” shall mean Guaranty as defined in Section 33. “Good Condition and Repair” shall mean Good Condition and Repair as defined in Section 7(a). “Hazardous Substance” means (i) any substance, material, product, petroleum, petroleum product, derivative, compound or mixture, mineral (including asbestos), chemical, gas, medical waste, or other pollutant, in each case whether naturally occurring, man-made or the by-product of any process, that is toxic, harmful or hazardous or acutely hazardous to the environment or public health or safety or (ii) any substance supporting a claim under any Environmental Law, whether or not defined as hazardous as such under any Environmental Law. Hazardous Substances include, without limitation, any toxic or hazardous waste, pollutant, contaminant, industrial waste, petroleum or petroleum-derived substances or waste, radon, radioactive materials, asbestos, asbestos containing materials, urea formaldehyde foam insulation, lead, polychlorinated biphenyls. “Impositions” shall mean the Impositions as defined in Section 8. “Improvements” shall mean the Improvements as defined in Section 1. “Indemnitee” shall mean an Indemnitee as defined in Section 14. “Investment Grade Criteria” as applied to any Person means that such Person has a credit rating of either “BBB-” or higher from S&P or “Baa3” or higher from Moody’s, (or an approximately equivalent credit rating from an alternative nationally recognized credit rating agency, as applicable). “Insurance Requirements” shall mean the requirements of all insurance policies maintained in accordance with this Lease. “Land” shall mean the Land as defined in Section 1. “Landlord Transfer” shall mean a Landlord Transfer as defined in Section 8. “Law” shall mean any constitution, statute, rule of law, code, ordinance, order, judgment, decree, injunction, rule, regulation, policy, requirement or administrative or judicial determination, even if unforeseen or extraordinary, of every duly constituted governmental authority, court or agency, now or hereafter enacted or in effect. “Lease” shall mean this Master Lease. “Lease Year” shall mean, with respect to the first Lease Year, the period commencing on the Commencement Date and ending at midnight on the last day of the twelfth (12th) consecutive calendar month following the month in which the Commencement Date occurred, and each succeeding twelve (12) month period during the Term. “Leased Premises” shall mean the Leased Premises as defined in Section 1. “Legal Requirements” shall mean the requirements of all present and future Laws (including, but not limited to, Environmental Laws and Laws related to accessibility to, usability by, and discrimination against, disabled individuals) and all covenants, restrictions and conditions now or hereafter of record which may be applicable to Tenant or to the Leased Premises, or to the use, manner of use, occupancy, possession, operation, maintenance, alteration, repair or restoration of the Leased Premises, even if compliance therewith necessitates structural changes or improvements or results in interference with the use or enjoyment of the Leased Premises or requires Tenant to carry insurance other than as required by this Lease. “Lender” shall mean any holder of a Mortgage secured by the Landlord’s interest in the Leased Premises, including without limitation, Mortgage Lender. “Monetary Obligations” shall mean Rent and all other sums payable by Tenant under this Lease to Landlord, to any third party on behalf of Landlord or to any Indemnitee. “Moody’s” means Moody’s Investors Service, Inc., or its successor in interest. “Mortgage” shall mean any mortgage lien on the Leased Premises, including the __________ Mortgage. “Mortgage Lender” shall mean __________, a ____________ corporation, and its successors and assigns. “Mortgage Lender Financing” shall mean that certain loan to Landlord from Mortgage Lender secured by, among other things, a first priority mortgage lien on the Leased Premises pursuant to the _________ Mortgage. “Mortgage Loan Documents” shall mean this Lease, the _________ Mortgage and those certain other loan documents of even date herewith executed by and entered into by Landlord in connection with the Mortgage Lender Financing. “Net Award” shall mean (a) the entire award payable by reason of a Condemnation whether pursuant to a judgment or by agreement or otherwise, or (b) the entire proceeds of any insurance required under clauses (i), (ii) (to the extent payable to Landlord), (iv), (v), (vi), (vii) or (viii) of Section 15(a), as the case may be, less any expenses incurred by Landlord in collecting such award or proceeds. “Non-Preapproved Assignee” shall mean Non-Preapproved Assignee as defined in Section 19(b). “Non-Preapproved Assignment” shall mean Non-Preapproved Assignment as defined in Section 19(b). “Partial Casualty” shall mean any Casualty which does not constitute a Termination Event. “Partial Condemnation” shall mean any Condemnation which does not constitute a Termination Event. “Permitted Encumbrances” shall mean those covenants, restrictions, reservations, liens, conditions and easements and other encumbrances listed on Exhibit “C” hereto (but such listing shall not be deemed to revive any such encumbrances that have expired or terminated or are otherwise invalid or unenforceable). “Person” shall mean an individual, partnership, association, limited liability company, corporation or other entity. “Preapproved Assignee” shall mean Preapproved Assignee as defined in Section 19(a). “Preapproved Assignment” shall mean Preapproved Assignment as defined in Section 19(a). “Prime Rate” shall mean the interest rate per annum as published, from time to time, in The Wall Street Journal as the “Prime Rate” in its column entitled “Money Rate”. The Prime Rate may not be the lowest rate of interest charged by any “large U.S. money center commercial banks” and Landlord makes no representations or warranties to that effect. In the event The Wall Street Journal ceases publication or ceases to publish the “Prime Rate” as described above, the Prime Rate shall be the average per annum discount rate (the “ Discount Rate ”) on ninety-one (91) day bills (“ Treasury Bills ”) issued from time to time by the United States Treasury at its most recent auction, plus three hundred (300) basis points. If no such 91-day Treasury Bills are then being issued, the Discount Rate shall be the discount rate on Treasury Bills then being issued for the period of time closest to ninety-one (91) days. “Renewal Date” shall mean Renewal Date as defined in Section 5(b). “Renewal Notice” shall mean Renewal Notice as defined in Section 5(b). “Renewal Term” shall mean Renewal Term as defined in Section 5(b). “Rent” shall mean, collectively, Basic Rent and Additional Rent. “Rent Commencement Date” shall mean Rent Commencement Date as defined in Section 6(a). “Requesting Party” shall mean Requesting Party as defined in Section 23. “Required Replacements” shall mean the Required Replacements as defined in Section 7(a). “Responding Party” shall mean Responding Party as defined in Section 23. “Restoration Fund” shall mean Restoration Fund as defined in Section 18(a). “Review Criteria” shall mean Review Criteria as defined in Section 19(b). “S&P” means Standard & Poor’s Ratings Services or its successor in interest. “_________ Mortgage” shall mean that certain Mortgage, Assignment of Leases and Rents, Security Agreement and Fixture Filing of even date herewith granted by Landlord for the benefit of Mortgage Lender to secure Landlord’s obligations under the Mortgage Lender Financing as evidenced by the Mortgage Loan Documents. “SNDA” shall mean SNDA as defined in Section 29. “State” shall mean the state in which the Leased Premises are located. “Successor Landlord” shall mean Successor Landlord as defined in Section 29(c). “Successor Party” shall mean Successor Party as defined in Section 19(a). “Surviving Obligations” shall mean any obligations of Tenant under this Lease, actual or contingent, which arise on or prior to the expiration or prior termination of this Lease or which survive such expiration or termination by their own terms. “Taking” shall mean (a) any taking or damaging of all or a portion of the Leased Premises (i) in or by condemnation or other eminent domain proceedings pursuant to any Law, general or special, or (ii) by reason of any agreement with any condemnor in settlement of or under threat of any such condemnation or other eminent domain proceeding, or (iii) by any other means, or (b) any de facto condemnation. The Taking shall be considered to have taken place as of the earlier of the date actual physical possession is taken by the condemnor, or the date on which the right to compensation and damages accrues under the law applicable to the Leased Premises. “Tenant’s Plans” shall mean Tenant’s Plans as defined in Section 12(d). “Term” shall mean the Term as defined in Section 5. “Termination Date” shall mean the Termination Date as defined in Section 17. “Termination Event” shall mean a Termination Event as defined in Section 17. “Termination Notice” shall mean Termination Notice as defined in Section 17(a). “Third Party Purchaser” shall mean the Third Party Purchaser as defined in Section 19(h). “Warranties” shall mean the Warranties as defined in Section 3(c). “Work” shall mean the Work as defined in Section 12(c). (a) The Leased Premises are demised and let subject to (i) the Permitted Encumbrances, (ii) any state of facts which an accurate survey or physical inspection of the Leased Premises might show, (iii) all Legal Requirements, including any existing violation of any thereof, and (iv) the condition of the Leased Premises in all respects as of the commencement of the Term, without representation or warranty by Landlord. (b) Tenant acknowledges that the Leased Premises are in acceptable condition and repair at the inception of this Lease. LANDLORD LEASES AND WILL LEASE AND TENANT TAKES AND WILL TAKE THE LEASED PREMISES “AS IS WITH ALL FAULTS”. TENANT ACKNOWLEDGES THAT LANDLORD (WHETHER ACTING AS LANDLORD HEREUNDER OR IN ANY OTHER CAPACITY) HAS NOT MADE AND WILL NOT MAKE, NOR SHALL LANDLORD BE DEEMED TO HAVE MADE, ANY WARRANTY OR REPRESENTATION, EXPRESS OR IMPLIED, WITH RESPECT TO ANY MATTERS CONCERNING THE LEASED PREMISES, INCLUDING, WITHOUT LIMITATION, ANY WARRANTY OR REPRESENTATION AS TO (i) ITS FITNESS, DESIGN OR CONDITION FOR ANY PARTICULAR USE OR PURPOSE, (ii) THE QUALITY OF THE MATERIAL OR WORKMANSHIP THEREIN, (iii) THE EXISTENCE OF ANY DEFECT, LATENT OR PATENT, (iv) LANDLORD’S TITLE THERETO, (v) VALUE, (vi) COMPLIANCE WITH SPECIFICATIONS, (vii) LOCATION, (viii) USE, (ix) CONDITION, (x) MERCHANTABILITY, (xi) QUALITY, (xii) DESCRIPTION, (xiii) DURABILITY (xiv) OPERATION, (xv) THE EXISTENCE OF ANY HAZARDOUS SUBSTANCE, OR (xvi) COMPLIANCE OF THE LEASED PREMISES WITH ANY LAW OR LEGAL REQUIREMENT; AND ALL RISKS INCIDENT THERETO ARE TO BE BORNE BY TENANT. TENANT ACKNOWLEDGES THAT THE LEASED PREMISES ARE OF ITS SELECTION AND TO ITS SPECIFICATIONS AND THAT THE LEASED PREMISES HAVE BEEN INSPECTED BY TENANT AND ARE SATISFACTORY TO IT. (c) Landlord hereby assigns to Tenant, without recourse or warranty whatsoever, on a non-exclusive basis, all assignable warranties, guaranties, indemnities and similar rights (collectively “Warranties”) which Landlord may have against any manufacturer, seller, engineer, contractor or builder in respect of the Leased Premises. Such assignment shall remain in effect until the expiration or earlier termination of this Lease, whereupon such assignment shall cease and all of the Warranties shall automatically revert to Landlord. In confirmation of such reversion Tenant shall execute and deliver promptly any certificate or other document reasonably required by Landlord. Landlord shall also retain the right to enforce any guaranties (i) to the extent of Landlord’s obligations hereunder, and (ii) upon the occurrence of an Event of Default. Tenant in its reasonable discretion, may enforce and shall comply with the terms of all Warranties in accordance with their respective terms, provided that if Tenant does not enforce any Warranty, Landlord shall have the right to do so. Tenant shall not take any actions which would cause any of the Warranties to lapse. (a) Tenant may occupy and use the Leased Premises as a data center and internet business exchange (“IBX”) collocation facility (and ancillary administrative or other support services) or any facility that as a result of technological changes is substantially equivalent, or a technological successor, to a data center and IBX collocation facility, so long as such change does not have any material negative impact on the value of the Leased Premises, or, for any other purpose previously approved by Landlord in writing and in a manner consistent with applicable Laws, Legal Requirements and the Permitted Encumbrances. In approving any alternative uses, Landlord shall act reasonably taking into account technological changes and changes in the telecommunications industry. Tenant shall not use or occupy or permit the Leased Premises to be used or occupied, nor do or permit anything to be done in or on the Leased Premises, in a manner which would or is likely to (i) violate any Law or Legal Requirement, (ii) make void or voidable or cause any insurer to cancel any insurance required by this Lease, or make it impossible to obtain any such insurance at commercially reasonable rates, (iii) make void or voidable, cancel or cause to be cancelled or release any warranty, guaranty or indemnity, (iv) cause structural injury to any of the Improvements or (v) constitute a public or private nuisance or waste. (b) Subject to the provisions hereof, so long as no Event of Default has occurred and is continuing, Tenant shall quietly hold, occupy and enjoy the Leased Premises throughout the Term, without any hindrance, ejection or molestation by Landlord with respect to matters that arise after the date hereof. (c) Landlord acknowledges that Tenant will operate the Leased Premises as a highly secure facility which has very limited access. As a result thereof, Landlord shall not under any circumstances enter the Leased Premises without being accompanied by a representative of Tenant and after, at least, 48 hours prior written notice. Subject to the foregoing requirement, Landlord shall be entitled to enter the Premises at the following times and for the following purposes: (i) as required to perform Landlord’s obligations under this Lease and to inspect the Premises to confirm that Tenant is in compliance with its obligations under the Lease, provided, however, that such inspection shall only occur once a quarter (unless an Event of Default exists in which case Landlord may enter the Leased Premises as often as Landlord deems necessary in its sole discretion, subject to the notice requirements set forth above), and (ii) showing the Leased Premises to prospective purchasers or lenders, or, during the last 180 days of the Term, to prospective tenants. Notwithstanding anything to the contrary but subject to the notice requirements set forth above in this Section 4(c), Landlord shall have access to the Leased Premises at ay time in order to enforce its self-help rights or any of its other remedies under this Lease. In exercising such entry rights, Landlord will endeavor to minimize, to the extent reasonably practicable, the interference with Tenant’s business.